With the lightning-fast pace of changing trends, topics and issues in the auto industry, we recognize the growing need for dealers to understand digital technology and marketing and the effects they have on their respective businesses. This year’s NADA Show will have more digital features and content than ever before. From interactive exhibits to targeted workshop sessions with real business solutions, NADA Show will tap into the heart of the kinds of digital content that dealers care about most. 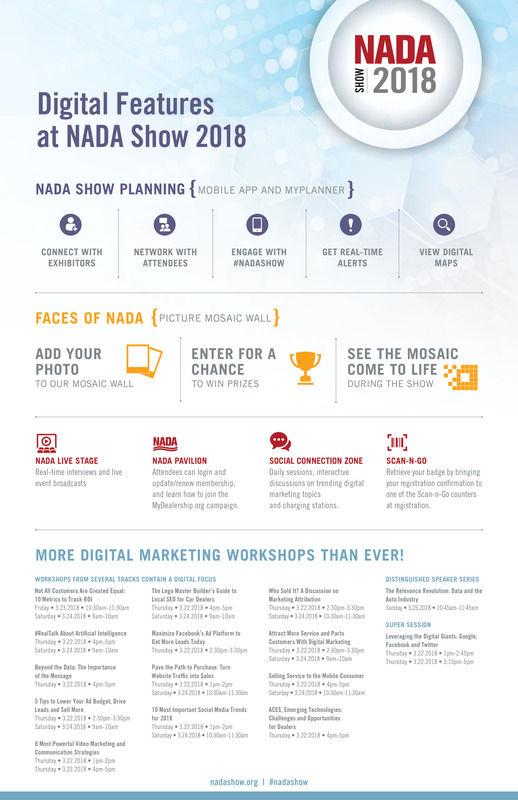 Check out just a few of the ways that NADA Show 2018 will allow you to get digital, both at the show and with fellow attendees. Now that you see what’s in store this March 22-25, 2018, don’t forget to reserve your spot at NADA Show 2018. Already registered? Be sure to log into the MyPlanner web app and get started with planning your weekend schedule, exploring what’s in store and connecting with Show exhibitors.